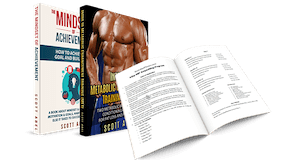 I recently re-released Metabolic Damage and the Dangers of Dieting, which was originally written about a decade ago. Back then it wasn’t long before I was rolling my eyes in disgust about what a buzzword “metabolic damage” had become in the industry. The term had been diluted to the point of nonsense. Now, a decade later, I am rolling my eyes again at what’s happening. Apparently the new trend is to claim that “metabolic damage” doesn’t exist. Here’s my claim: of course metabolic damage exists. 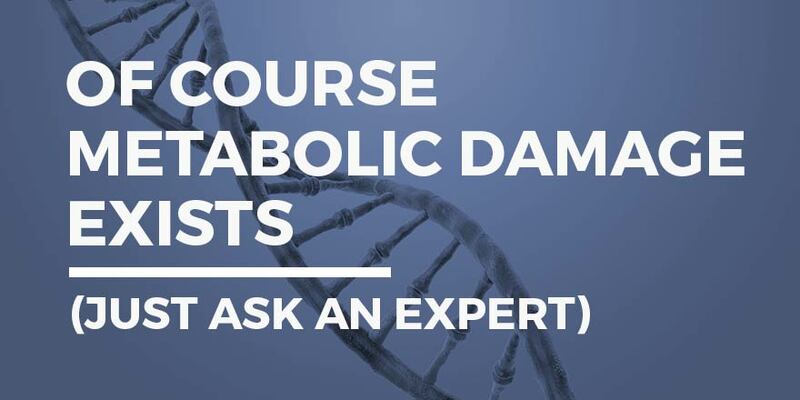 First, most people in denial of metabolic damage are simply people who don’t deal with it professionally, and don’t have to, at least not in real terms. I’ve been dealing with it with clients since well before 2003. Yet according to internet logic, I am supposed to abandon what I see week in and week out because a study proving it exists isn’t out there yet. People take this to mean that since a certain kind of research doesn’t exist, there is no science to back it up. The fact is universities are not lining up to do studies on the long-term effects of figure and bikini competition diets combined with crazy amounts of cardio on people who are already lean. (And as you’ll see below, there are other issues with trying to isolate the variables in human metabolism.) With that in mind, you have to know where to look for true expertise in regards to metabolism and the actual science behind it, because the expertise and science is there. When you want to learn about strength you go to a strength expert. When you want to learn about endurance you go to an endurance expert. And when you want to learn about metabolism… well, you go to experts on metabolism: endocrinologists, internal medicine experts, and so on. These people are out there. They just don’t publish in the fitness industry. I was recently linked to a lecture by Dr. Diana Schwarzbein. She is an endocrinologist, and has been practicing (that is, working with real clients) for 25 years. I’ll actually show the lecture below, because it wonderfully articulates a few key points about the nature of metabolism and science that is well-worth listening to and watching, especially if you’re mostly familiar with the academic research cited by the fitness industry, or you’re on the fence about metabolic damage because so far you haven’t seen an actual verified, double-blind placebo-controlled study to show it. For those of you who really want to learn, please watch all of both parts. It’s got tonnes and tonnes of good stuff. A bit further below I’ll mention just a few key themes with time stamps, for those who are interested. What you’ll see in the lecture is a true expert in human metabolism who uses the phrase “damaged metabolism” over and over again. She makes many of the same points I’ve made in my books and my blogs. She criticizes fitness trends and sacred cows like low-carb and keto diets, Paleo diets, just to name a few. I wish I had these lectures in writing my books, but they were only recently just sent to me. Notice that Dr. Diana Schwarzbein is a true expert. She’s a board-certified endocrinologist, and she has 25+ years of experience with internal medicine and is a noted expert on metabolism. She also uses the term “metabolism” as a blanket term that includes hormonal function and balance and health, and biochemical wellness and health as well. I doubt she would have a problem with the term “metabolic damage” as a catch-all term that considers a whole host of risks, causes, and effects. “Metabolic” is a term that encapsulates a variety of biological activities and biochemical processes. Your “metabolism” is not a number of daily cals burned; it includes a host of biochemical functions and processes which link together a whole host of human systems. The fitness industry wants to reduce it to “cals in, cals out.” Sorry, but no. All our bodily systems are integrated; they don’t work by themselves; they work in concert with the others. I present her two-part lecture here for those of you who truly want to learn something. I’m astounded by how good this lecture is. I wish Dr. Schwarzbein had an interest and an access to post-contest competitors — when you watch the lecture, think about what she talks about (average yo yo dieting, skipping breakfast, the kinds of diet mistakes “regular people” make etc.) and how she talks about longterm consequences of these things, and then think about the crazy extremes competitors go through. I don’t want to reduce her lectures to just three themes, because there is of course so much more going on. But I think the following three themes are relevant to metabolic damage and the debates I’ve seen over “whether” it exists or not. Metabolism is NOT just daily calories burned. You can’t think about the body in terms of individual, isolated compartments. At 11:20 of part 1 she says “for lack of a better term, a holistic approach.” I think that sums it up nicely. 18:14 — “We have to step away from just thinking ‘energy in, energy out.’ Because ‘energy in, and energy out’ is only talking about one of those biochemicals, and that’s the energy biochemicals.” Then she continues at 18:44, to ask, “How many of you are under the impression still that it’s all about ‘calories in, calories out’?” Her point isn’t that thermodynamics are magically upset, but that there’s more going on. But 25:00 to 35:00 of part 1 seems to be the most relevant meat of this. That’s the part where she talks about how there are no double-blind, placebo controlled studies for this kind of thing, and there never will be, because that’s just plain not how biochemistry works. There are too many variables to test in that kind of controlled environment. Indeed the first point/theme above is one important aspect of the “why” behind this second point. She also tells the story about how she was attacked for not waving these double-blind placebo-controlled studies around, and that part’s gold. That story starts at 29:00. Real academia is about the science and not necessarily about having a PubMed abstract handy to frantically and mindlessly wave around. To that I say, amen! The fitness industry seems these days to only recognize science if it comes in the form of just such a study. This is myopic. That’s not how science works for certain things. You can’t test everything in that way on human subjects. Most studies such that are run are very limited in terms of what “conclusions” you can actually extrapolate from them, but everyone forgets this when mindlessly waving them around. So often, “the science” and “the studies” are not the same thing at all, and so many things, including metabolic damage, cannot be properly examined with these kinds of studies, especially given the limitations of funding, and the fact that most universities aren’t about to pour money into looking at the long-term effects of physique competition. This does not mean that the science behind the concept doesn’t exist. Now, let me be clear here. I’m not dismissing studies. I’m saying don’t wave them around blindly, and understand what they can and cannot do. Double blind, placebo-controlled studies absolutely have their place. They are extremely important for science-based research, and for opposing quack medicine and therapies. You just have to understand what their limitations are as a whole, and what the limitations are of any particular study (what conclusions you can actually draw from it, etc.). Paul A. Offit’s Do You Believe in Magic? goes into them, for example, to show that most supplements, vitamins, and alternative medicines offer pretty much no benefit. Ironically, many people who say “metabolic damage doesn’t exist” take plenty of supplements with no science to back them up at all. Does “cycling low-calorie diets” sound somewhat like what I call “yo-yo” dieting? Hm? Once you consider the points 1 and 2 above, regarding what we mean when we say “metabolism,” then of course she uses the term “damaged metabolism”! Once you consider what she’s really trying to get across about the nature of hormones and the human body and so on, the idea that metabolic damage doesn’t exist is just plain absurd. She also basically talks about the immediate, residual, and cumulative effects of dieting, and how dieting feels good “at first.” At 26:10 of part 1 she says, “Yes, it feels good to break down. It feels great to break down… until you’re broken.” Then right after she goes on and asks, “how many of you have gone on diets where it feels good at first?” How many times have I talked about the anti-catabolic early phase of a diet? It feels good “at first” but that’s not accounting for the residual and cumulative effects of dieting! She talks about this more generally too when she goes on about causes vs. symptoms, and the fact that the causes are often way way back in the past, not just when you first started experiencing the symptoms, which only manifested when things had finally built up over time. At 27:46 of part 1 she says, “Losing weight by breaking down is THE WRONG WAY to lose weight.” Yes! This is why in my book about the Cycle Diet, I said a sustainable diet must be metabolism first, weight loss second. Most “diets” mix these two up, so their longterm sustainability goes out the window. At 44:38 of part 1 she notes that high protein, low-carb diets are even worse than high-carb, low fat were back when they came into prominence! Yet note that high protein, low carb approach is the most common contest-prep diet approach for women; especially in those final weeks near the end, as contest date approaches. If you explained to Dr. Schwarzbein what women go through for contests, I can’t even imagine her reaction. At 57:30 of part two she says it can take “years” to heal metabolic issues. She’s being specific in the ones she’s mentioning here. I’m being more general. But yes, from what I’ve seen, it can take years. And yes in order to “heal,” then by implication, some kind of “damage” must have been done. Hey Scott! Thanks so much for these lectures. They are so educational and have further my understanding on the science. Required watching for the industry but who are we kidding, most will just dismiss this information. Thanks again! Okay, I get about not fasting, etc. to lose weight. Something I don’t need anyway. However, what about detoxing? isn’t fasting good for detoxing? In fasting, I don’t mean water, I mean juices and smoothies. Wow, so highly informative and even ends with a “sheesh”. Great reply. I know my body is constantly detoxing but I’ve been sickly since being exposed to toxic black mold and my body seems to get overloaded very quickly now when I’m exposed to anything even remotely toxic. I tried the paleo and GApS diets to starve the mold out of my body. Bad move. I got a hundred times sicker immediately. But, I have sensitivities and outright allergies now to things that never used to bother me, and my system easily feels and looks toxic afterward. Okay, sorry, the ‘sheesh’ was uncalled for. Are you doing the so-called ‘extreme mold avoidance’ popularized by Erik ‘Mold Warrior’ Johnson? If so, then many have found their sensitivities and allergies get a lot worse, something that the extreme avoiders have never been able to explain, and I don’t understand it either. But avoiding certain foods by trying faddish diets like Paleo and GAPS won’t ‘starve’ the mold away. I’d recommend googling either “Matt Stone” or “Joey Lott” and ‘toxic mold’ for a more measured, less fear-based approach. Lott has recovered completely from mold toxicity, unlike Johnson. Thank you!!! Yes, I got the Mold Warrior book and went to a Dr. who did those extreme fear based approaches and got REALLY sick. He also gave me three antibiotics to kill some bacteria in my nose he said is caused by the mold. i got even sicker after that. I came across this site via an email Matt Stone sent out to his listers, and I’ve read his book on hypoglycemia (I’ve been diagnosed with reactive HG). I will absolutely google Joey Lott. thank you again for taking the time to give me helpful info. These were great. I love to hear solid information on diet for a change. Your commentary was good, too, but quoting Paul Offit won’t help your argument…..he’s the most notoriously self-serving guy out there. If he can’t make a buck off of it, he disparages it. Thanks for the reply. Makes sense. … Also, she is not a physique artist, so I’d imagine that you need to take different tactics to do what you do.